Create fine etch like patterns and images with EtchCoat. This product has a "orange peel" effect. Available in various degress of textures. A UV coating that creates a sand texture. Silver and gold scratch off material with colored overprints. 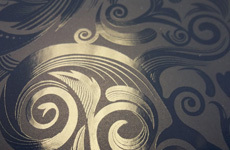 Create an embossed effect, texture and definition with StepTex. Let the film lamination create your hinge. Lays and folds flat. A UV coating that can add that subtle extra "bling" to your project. The raised gloss UV picks up the grain of the paper. Bond 2 sheets together to help create functional and interactive products. 1 off's with whites and spot gloss UV. 1 or 2 sides, full sheet or spot coating. 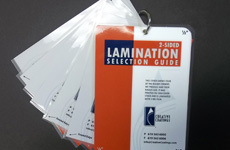 Lamination can be applied to 1 or 2 sides, and up to 48" wide. 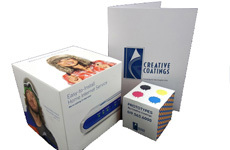 Creative Coatings is your partner in not only post press finishing but also complete fulfillment of your project. With an average printing experience of 20 years, our team can provide the expertise and assistance in working through your project to ensure a successful product. 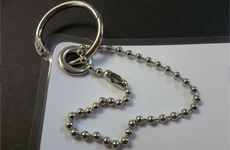 You're not only buying finishing services, but also knowledge, experience, and integrity. We are here to help. Our mission statement: Creative Coatings is dedicated to making our customers successful and profitable by partnering with them before, during, and after production.